…for me to post the interview of Rise N Shine! But first, I’d like to wish Lance the best of luck with his move to Florida as it’s not only half way across the world, it’s also a HUGE change of way of life and a totally different culture. Hat’s off to you Lance! So a couple of weeks back, I had the opportunity to sit down with and interview two skydivers who have mentored other skydivers, spent plenty of time fun jumping, one even started a business and all the while, they managed to win the Canadian nationals for Artistic Freeflying. Bruno and Olga are the two “faces” of Rise N Shine. I say faces as they are the two who are seen on camera, however as we’re about to learn, Artistic FF is a whole different ballgame. The camera person is considered a part of the team and so (s)he has an effect on the final score the team tallies. Adam: So can you guys tell me, what exactly is the difference between Artistic Freeflying and VFS (Vertical Formation Skydiving)? Bruno: Artistic freeflying encompasses all the positions that are involved in skydiving, be it sitfly, head up, head down, back flying, belly flying, whereas VFS is usually head down or sit flying and is usually a 4 person team. In VFS you aim to get the most points by doing predefined figures in the sky. In Artistic, you are scored for the quality of your presentation. The person filming is just as important as the people flying in front of the camera. You have to implicate the person in your show. You are also ranked on the difficulty of the moves you attempt. Olga: You’re putting on a show for the people watching the video. Adam: Sort of like figure skating? Olga: Yes, but in freefall. Bruno: We had been working together for two years before we decided to form a team. Adam: Why Artistic freefly? Why not VFS or RW? Bruno: Olga has had a lot more experience than I did. She’s been in many competitions and had already done some Artistic Freefly before. Bruno: Well, we started together in 2009. In 2010 the team was started. In 2011 we won the nationals. And now we’re here, preparing to go to the Worlds in Dubai in December. Adam: How long have you two been skydiving? 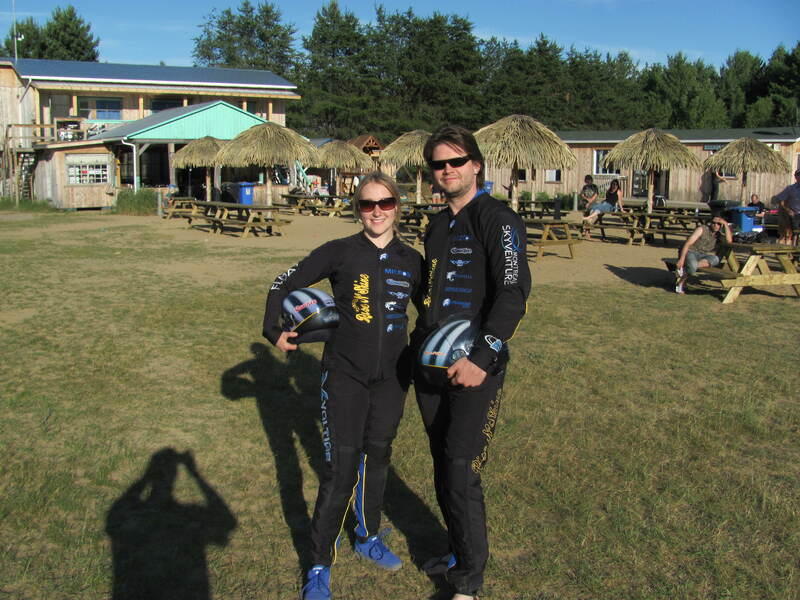 Olga: My first couple of skydives were in 2003 in Russia, which were done with the round military parachutes. Then I moved to Canada in 2004, so by the time I was able to get myself organized and get around to doing my PFF it was 2005. Bruno: I started in 1999, but I had a much slower progression, I was mostly just doing fun jumps here and there, I wasn’t paying much attention to competing, to me the sport was for fun. The motivating factor was when I got my job at SkyVenture. I realized that I was enjoying improving my skills constantly. Once I met Olga, she coached me and my skills exponentially improved. Competition was a way for us to set an objective for ourselves. Olga: It’s a goal that we set for ourselves which had a deadline so we had no choice but to be ready by then. Adam: I’m sure you’ve heard this a lot, but why do you skydive and why compete? Olga: We do this because it helps us push new skydivers to try the sport and, more specifically, to Artistic Freefly. This discipline is relatively small in Canada, compared to the United States and Europe. Bruno: Our primary activity is to compete, but also to Coach. It allows us to share our passions while hoping to bring more people to competitions. And hopefully have more friends to play with in the sky. Adam: What competitions have you participated in? Aside of course from the SkyVenture competition a few weeks back. Bruno: In total, we’ve participated in two tunnel competitions and the nationals once. But 2011 was mostly a team planning year where we built our strategy and formed the team properly. Before competition, there’s a lot of mental preparation, which takes a while to develop. We alsoneeded to make our preparation for the competitions efficient and effective. Olga: We’re definitely more efficient now. Bruno: We took 1st place in the 2011 nationals, which allows us to go to the Worlds in Dubai in December 2012. As part of our preparation for the 2012 Worlds, we’re also going to the US nationals in November. Olga: With 2011’s experience we can much better prepare ourselves for competitions. Adam: How exactly do you compete by the way? Olga: An Artistic Freefly competition consists of seven rounds. Typically, those 7 rounds comprise of 5 rounds of open routines where the team is free to do anything they want as long as the routine, submitted to the judges is followed. Most teams will do the same routine 5 times over because it’s easier to learn one routine than it is to learn 5 different ones. Those 5 rounds are judged on the difficulty, the esthetics and the execution of the routine. There is a grid that the judges use to figure out how many points of difficulty they can attribute for the move that is done. Bruno: The other two rounds of the competition are a bit different. You can still do whatever you like in it, but the judges set four elements to the routine that must all appear in the routine. Adam: So basically if they ask for a back flip where Olga flips around you, and a barrel roll, you can do a barrel roll, then switch to head down and circle around each other, then do the flip thing? Bruno: Yes. But you have to keep in mind the difficulty grid. If the team chooses to do something very difficult and has sloppy execution of the move, they will end up with a lower score than a team who chooses a simpler routine and does it perfectly. Adam: What’s your mission exactly? Bruno: Our mission as a team is to train ourselves, to compete and win of course. But it’s also truly about making Artistic Freefly popular. Adam: I can see a LOT of logos on your jumpsuits, who are your main sponsors? Olga: Parachutisme Voltige and SkyVenture are two of our main supporters. They are directly involved in our training. Adam: So you two mentioned that the cameraman is a part of the team, who is your cameraman? Bruno: Last year we worked with Philippe Thibodeau, who acted as a cameraman and who played a very important role in launching the team. Today, our cameraman is Richard Guilbault. Philippe remains highly involved as a coach. I’d like to thank Rise N Shine for taking the time to sit with me. Bruno and Philippe have both taken the time to coach me in the past and Phil even taught Geneviève (My girlfriend and photographer) to sitfly. 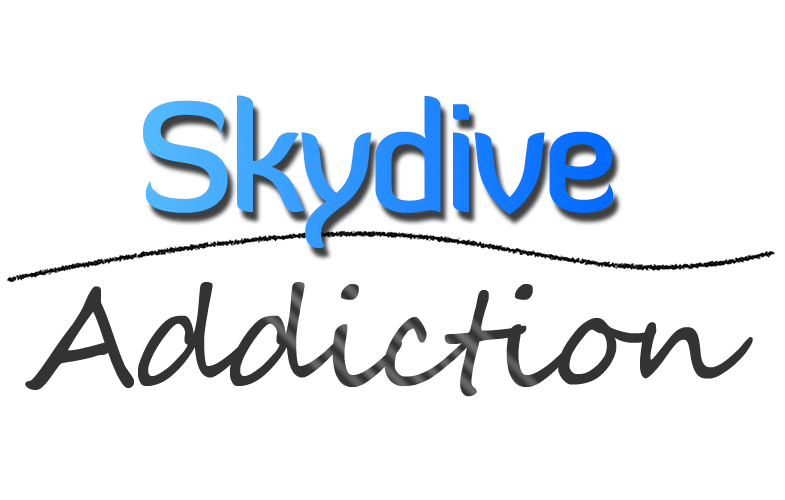 If ever you’re around SkyVenture and want to learn from some top level skydivers, give them a shout, they’re always happy to teach! And of course, if ever you want to see them fly, just head to Voltige in Joliette Quebec on any given weekend, you’ve got great chances of being on a load with them! … pour que je vous parle de l’entrevue de Rise N Shine! Mais avant tout, j’aimerais souhaiter à Lance le meilleur dans son déménagement en Floride car ce n’est pas seulement un déménagement à l’autre bout du monde, c’est aussi un changement ÉNORME de mode de vie et une culture complètement différente. Chapeau Lance, chapeau. Donc il y a quelques semaines, j’ai eu l’opportunité de m’asseoir et faire un entrevue avec deux parachutistes qui ont étés des mentors, ont eu pleins d’opportunités à faire des fun jumps, un d’entre eux à même parti une entreprise et tout cela en même temps qu’ils étaient en train de s’entrainer et même GAGNER les nationaux Canadiens de Freefly Artistique. Bruno et Olga sont les deux “faces” de Rise N Shine. Je dis faces car ils sont les deux qui sont vus sur la caméra. Par contre, comme nous allons bientôt apprendre, le Freefly Artistique est un jeu complètement différent. Le caméraman est considéré une partie de l’équipe donc il/elle a un effet sur le pointage final de l’équipe. Adam: Pouvez vous me dire quel est la différence entre le Freefly Artistique et le VRV (Vol Relatif Vertical)? 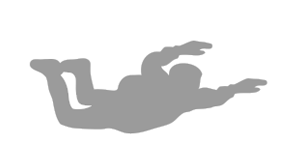 Bruno: Le Freefly Artistique inclus toutes les positions qui font partie du skydive soit le sitfly, head up, head down, back fly ou belly fly tandis qu’en VRV c’est plus souvent du head down ou du sit et d’habitude, c’est une équipe de 4 personnes. En VRV l’équipe vise d’avoir le plus de points possible en faisant plusieurs figures prédéterminés dans le ciel. En artistique, l’équipe est mesuré pour la qualité de leur présentation. La personne qui est en train de filmer est aussi important que les personnes qui volent en avant de la caméra. On doit impliquer la personne dans le “show”. Vous êtes aussi noté sur la difficulté des manœuvres que vous tentez. Olga: Tu es en train de faire une pièce pour la personne qui regarde la vidéo. Adam: Un peu comme le patinage artistique? Olga: Oui, mais en chute libre. Adam: Comment avez-vous rencontré l’un l’autre? Il me semble qu’il faut vraiment bien connaître ton partenaire pour pouvoir bien performer en Freefly Artistique. Olga: Nous avons tous les deux fait partie de la première équipe d’instructeurs au SkyVenture Montréal. Étant donné que nous étions engagés pour le tunnel avant l’ouverture, on est allé au San Francisco pour faire notre formation. Bruno: Nous avons travaillé ensemble pendant deux ans avant de décider de former une équipe. Adam: Et pourquoi le Freefly Artistique? Pourquoi pas le VRV ou le VR? Bruno: Olga avait beaucoup plus d’expérience que moi. Elle à participé dans plusieurs compétitions et elle avait déjà fait un peu de Freefly Artistique. Adam: Comment s’est passé la progression de Rise N Shine? Je suis certain que vous ne vous êtes pas simplement regardé le jour d’un tournoi et pensé “On va faire un équipe aujourd’hui”. Bruno: Au faite, nous avons commencé ensemble en 2009. En 2010, l’équipe à été formé. En 2011, nous avons gagné les nationaux Canadiens. Et maintenant, nous sommes là en train de se préparer pour aller aux Mondiaux à Dubai en Décembre. Adam: Depuis combien de temps faites-vous du parachute? Olga: Mes premiers sauts étaient en Russie en 2003. Ils se trouvaient à être avec des parachutes ronds militaires. Après cela, j’ai déménagé au Canada en 2004, et jusqu’à ce que je me suis organisé et finalement eu l’opportunité de faire mon cours PAC il était déjà 2005. Bruno: J’ai commencé en 1999, mais j’ai eu une progression beaucoup plus lente. La plupart du temps, je faisais des fun jumps ici et là. Je ne portais pas trop d’attention à faire des compétitions. 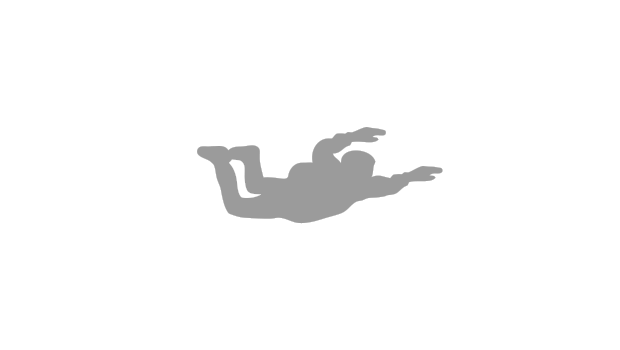 Pour moi, le parachute était pour m’amuser. Le facteur motivant arriva lorsque j’ai eu mon emploi au SkyVenture. J’ai realisé que j’aimais améliorer mes habilités constamment. Lorsque j’ai rencontré Olga, elle m’a coaché et mes habilités se sont améliorés exponentiellement. Les compétitions étaient une façon pour nous d’avoir un objectif fixe pour nous-mêmes. Olga: C’était un but que nous nous sommes donné qui avait une date fixe donc nous n’avions pas de choix sauf d’être prêt pour ce moment là. Adam: Je suis certain que vous entendez ceci souvent, mais pourquoi faites vous le parachute et encore plus, pourquoi participer dans des compétitions? Olga: On le fait car c’est une façon qui nous aide à pousser d’autres parachutistes à essayer le sport et plus spécifiquement à essayer le Freefly Artistique. Le sport est relativement inconnu au Canada comparé l’Europe et aux États-Unis. Bruno: Notre activité principale est de participer à des compétitions mais aussi de Coacher. Cela nous permet de partager nos passions et espérer d’amener plus de gens aux tournois. Et bien sur pour avoir plus d’amis avec qui jouer dans le ciel. Adam: Dans quelles compétitions avez-vous participé? Mis à part bien sur celui de SkyVenture il y a quelques semaines. Bruno: Au total, nous avions participé à deux compétitions de tunnel et une fois aux Nationaux. Mais 2011 était pas mal un an de planification ou nous avons préparé notre stratégie et formé l’équipe correctement. Avant une compétition, il y a beaucoup de préparations mentales qui prends énormément de temps à développer. Nous avions aussi eu besoin de rendre nos préparatifs plus efficaces et effectifs. Olga: Nous sommes définitivement plus efficaces maintenant. Bruno: Nous avons pris la 1ère place dans les Nationaux en 2011 qui nous permet d’aller aux Mondiaux à Dubai en Décembre 2012. Comme préparatif pour les Mondiaux, nous sommes aussi enregistrés pour participer aux Nationaux Américains en Novembre. Olga: Avec nos expériences de 2011, nous pourrons nous serons beaucoup mieux préparés pour les compétitions dans le futur. Adam: Et comment exactement se déroule un tournoi de Freefly Artistique? Olga: Un tournoi consiste de sept rondes. Typiquement, les sept rondes sont comprises de cinq rondes de routines ouvertes ou l’équipe est libre de faire n’importe quoi tant que la routine qui à été soumise aux juges à été suivi. La plupart des équipes font la même routine cinq fois de suite car c’est plus facile d’apprendre une routine qu’il est d’en apprendre cinq différentes. Ces cinq rondes sont jugées par leur difficulté, l’esthétique et l’exécution de la routine. Il y a un barème que les juges utilisent pour décider combien de points qu’ils peuvent attribuer à leurs mouvements. Bruno: Les deux autres rondes de compétition sont un peu différentes. L’équipe est encore libre de faire ce qu’ils veulent pendant la routine, mais les juges mettent quatre éléments qui doivent tous absolument apparaître dans la routine. Adam: Donc pour simplifier, si ils demandent un salto arrière ou Olga fais son salto au dessus de toi, et un tonneau, tu peux faire un tonneau, par la suite, faire un switch et faire du head down et faire le tour l’un de l’autre et après faire le salto? Bruno: Oui, mais tu dois garder en tête qu’il y a encore l’histoire du barème de difficulté. Si l’équipe choisis de faire quelque chose de très difficile et l’exécute mal, ils auront un pointage moins élevé qu’une équipe qui à choisi une routine plus simple et l’ont exécuté parfaitement. Adam: Quel est vôtre mission exactement? Bruno: Notre mission comme équipe est de nous entrainer, de faire des compétitions et bien sur de gagner. Mais avant tout, il est aussi d’aider à rendre le Freefly Artistique plus populaire. Adam: Je vois beaucoup de logos sur vos jumpsuits, qui sont vos commanditaires principaux? Olga: Parachutisme Voltige et SkyVenture sont deux de nos commanditaires principaux. Ils sont directement liés à notre entrainement. Adam: Vous avez mentionné que le caméraman fait partie de l’équipe. Qui exactement est votre caméraman? Bruno: L’année dernière nous avons travaillé avec Philippe Thibodeau qui à agi comme caméraman et à joué un rôle très important dans le lancement de l’équipe. Aujourd’hui, nôtre caméraman est Richard Guilbault. Philippe reste très impliqué comme coach. Bruno: Artistic is less accessible at first as it’s much harder and needs more training, but once you learn it, it permits you much more than belly flying ever could. J’aimerais remercier Rise N Shine pour avoir pris le temps de vous asseoir avec moi. Bruno et Philippe ont tous les deux pris le temps de me coacher dans le passé et Philippe à même entrainé Geneviève (Ma copine et photographe) à faire du sitfly. Si jamais vous êtes au SkyVenture Montréal et vous voulez apprendre quelque chose de quelques parachutistes de haute niveau, demandez les, ils sont toujours heureux d’enseigner! Bien sur, si vous voulez les voir voler, allez simplement faire un tour à Voltige à Joliette, Québec une fin de semaine, vous aurez de bonnes chances d’être sur un load avec eux! Blue skies tout le monde! Thanks Adam, I’m looking forward to the move, it’s going to be a major change!